San Francisco: As buyers continue their exodus away from expensive truck-based SUVs, Acura is hoping to cash in by entering the crossover field with a new model, the RDX. This sporty wagon is focused like a laser at the so-called entry premium market, which is expected to grow fivefold in the next few years. The new RDX starts with a distinctive appearance, which takes the tall-wagon shape and adds Acura-style edges and points from the brand’s newest design language. Acura’s first vehicle with standard 18-inch wheels and tires, the RDX flaunts a macho stance devoid of the stigma of working for a living. The RDX is for taking friends to the cabin at Lake Tahoe, not for hauling loads of gravel to the worksite. With its flat-folding rear seat and liftgate you could haul a pretty good load of stuff if you wanted to. 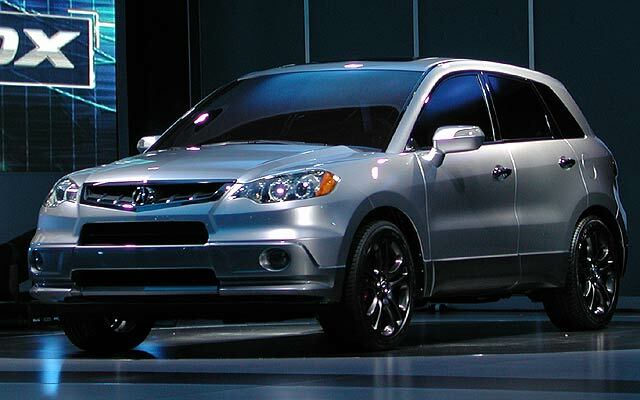 Every RDX comes with Acura’s 2.3-liter first-ever turbocharged four-cylinder engine. This intercooled turbo cranks out a vigorous 240 horsepower and an even more remarkable 260 lb.-ft. of torque. Under the hood Acura provides a Variable Flow Turbo (VFT) and Variable Valve Timing and Lift Electronic Control (VTEC), and Variable Timing Control (VTC). All of these acronyms represent the use of a sophisticated computer and sensors that evaluate the car’s needs and make sure that the engine is providing whatever is necessary for performance, safety, and low emissions. The car leaps ahead effortlessly, so it must be doing its job. Acura claims mileage of 19 City and 23 Highway, but my weeklong test drive accumulated 16.9 mpg. If you want better mileage, there are host of non-luxury crossovers with non-turbocharged fours that can do better, but you won’t have as much fun driving them. Acura offers only a five-speed automatic on the RDX, but it works well with the engine and can be shifted manually with steering-wheel-mounted paddles. These paddles have a precise, nicely weighted feel, but are nothing like a manual shifter, which you cannot have (and most buyers presumably don’t want). Acura’s Super Handling All-Wheel Drive system (SH-AWD) has been available in their cars for awhile, and now in the RDX provides safe traction while serving up generous servings of road feel and responsiveness. The SH-AWD system balances the torque load between the front and rear axles and also through the left and right rear wheels. The system reduces understeer (the tendency of a car to go straight in a turn) so steering chores are precise and easy. My Carbon Gray Pearl test car looked muscular but compact on the road compared to a traditional SUV. The laid-back windshield, raked sides, and tapered rear panel eliminate the boxy look and make the vehicle look like it’s shearing through the air. Acura uses satin-finish trim rather than chrome outside, which is elegant and unusual. I was surprised how far the lower front panel was tucked under until I realized that despite the car’s 65.5-inch overall height, the optical trick made the nose look lower and car like. The gray, silver, and taupe interior of my tester looked and felt upscale, and had a bit of whiz-bang styling that created a mood of adventure and play. Honda and Acura cars are starting to deliver some excitement now after years of following a restrained, sober design philosophy. There are loads of standards on the RDX, from the typical power windows, locks and mirrors to dual zone climate control, a potent 360-watt premium sound system, leather seats (with eight-way power driver’s adjustment), tilt and telescope steering wheel, power moonroof, and information display. Every RDX is a premium model, there’s nothing less loaded available. That doesn’t mean you can’t have more. The Technology Package offers a host of worthwhile items, from a ten-speaker super sound system with XM Satellite Radio to a navigation system with voice recognition (very Star Trek), a rearview camera, hands free cell phone availability, the AcuraLink Satellite Communication System, and more. It’s fun to talk to the system to make changes, just push the little button on the steering column as you speak and the screen changes to what you want. My tester came with a formidable list of commands and the few I used worked perfectly. Over time, this could be a major safety feature as your eyes stay on the road instead of dropping down to the dashboard. The RDX feels tight and fun around town and stretches out and cruises happily on the freeway. Wind and road noise are minimal, the seats are supportive, and the engine sings as it flies. The RDX gives you a boost gauge, so you can see dramatic results every time you mash the accelerator (the gas gauge heads down as the boost goes up, of course). Acura’s larger MDX SUV has been around for years now, and has been redone and grown a bit for 2007. The RDX, however, is exactly 10 inches shorter, about five inches narrower, and sits on a four-inch shorter wheelbase. It’s also more than 600 pounds lighter, so this is really a different class of car, one that fits nicely into today’s narrow parking spots and feels nimble out in traffic.